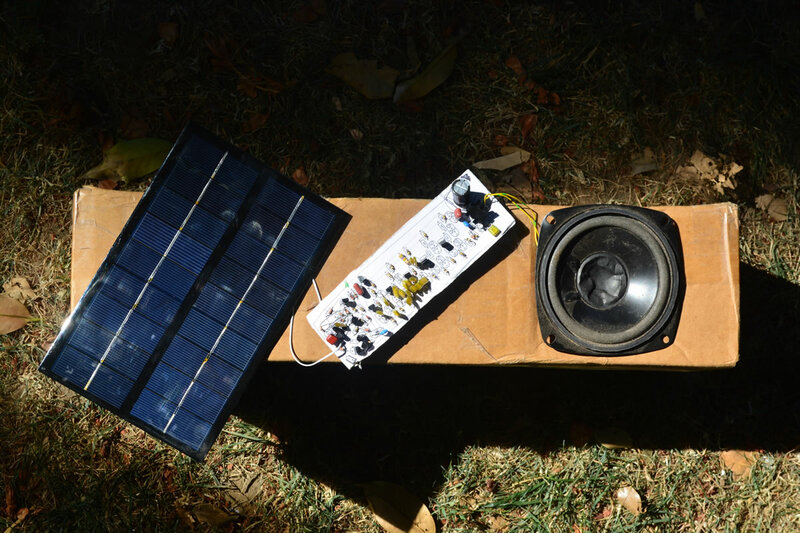 A solar (panel-powered) sounder contains circuits to drive a speaker. Rather than treat them as a synthesizer, the author emulates specific acoustic sounds in analogue electronics and listens to their behaviour in different solar energy conditions. 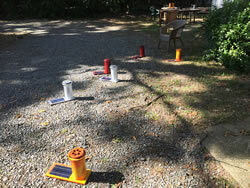 A group workshop builds a solar sounder flock of simple transistor circuits and installs the units in the sun. The premise belies an awareness of outdoor sounds and a yearning for electronics that can explore them. The sun energizes a solar panel on a box with an analogue synthesizer in it to sound out a speaker. Without batteries, the box reacts to gestures of shadow on its face and full darkness silences it. It sounds different on hazy days, cloudy days, sunny days. Outfitted in a thick-wall cardboard box, the acoustic object plays itself. I call it a “solar sounder”. In a recent order to my solar panel dealer 1[1. Sunny Chuang is a solar panel merchant out of Hong Kong. The panels in question are labeled GH125X195, as they measure 125 by 195 mm. They encapsulate 18 polycrystalline wafers in series, for a total of 9 V at 3 W.], I purchased a couple of larger panels to prototype solar sounders. I found that 9 V at 3 W power a “speaking voice” speaker and a bit of circuitry to synthesize the sound. An electrolytic capacitor stiffens the current for the amplifier, but the box still reacts to changing light. Besides their solar panels, the boxes have no other playing interface such as knobs or switches; the art is not in the action of playing them, but placing them in the sun and listening (Fig. 1). I think of these not as musical instruments, but installation tools. Instead of offering a universal palette of sounds, the circuits focus on specific acoustic sounds. In this work, the analysis of three “voices” begins the task of emulation. For a solar-modified sonic environment, I chose a bird, Tibetan monks and the trains I hear at night. Consider the sound-making apparatus of each — a throat for the monk and the bird, and a horn for the train. Imagine its interface, how to control it and how it makes sound, to conceive a model for its timbre. Then consider the triggering brain and what triggers it to sound — territorial concerns, meditation, emergency or other contingencies. In the emulating medium (circuits or code), work backward from the brain, ending with the physical sound becoming electronic. These three acoustic studies and their circuit emulations ask compositional questions: How closely to imitate? How far “off” can the imitation stray so as to evoke only a poetic allusion to the original? These questions inspire synthesizers in this piece, to excite a “hackerspace” that is enthusiastic for the many and varied implementation possibilities. Here, we hack not an object of technology, but an existing sound. Solar power is a compositional constraint for these boxes; without batteries or a “stiff” voltage source, the circuit components can bend the sounds. 2[2. The idea of a “circuit bend” comes from the circuit bending movement, where hackers open up a commercial (sound-making) device, such as a toy, and reconnect it in ways unintended by the original manufacturer, to make new and exciting sounds. Extending this concept, a circuit can bend itself in the following way: the components exert strain on the power supply and if it should yield not ideally stiff current, then components will “talk” to each other through the power supply; they make new connections, as if hacked or bent.] The result reveals idiosyncrasies between designs and even between “exact replicas”. As the sun moves through the day, the units change their sound under its influence; the shadows of trembling leaves make the sound rise and fall in the wind, and a passing cloud causes it to wilt. A circuit can bend itself. In a solar sounder workshop, participants build and customize the following bird, monk and train circuits. The resulting ensemble reveals the unique properties of each piece; leveraging their differences, they paint a spectral smear around the emulated voice. A performance gesture arises from their response to sun and shade with sound and silence. The workshop organizer must curate a special space, with well-lit tables for solder working and sunny, reverberant spaces for the energy work. Workshop participants can customize the sound of each box by changing capacitors, which set frequency and timing characteristics. In this way, the emulation alludes to the breadth of variation in virtual voices. For example, an electronic bird calls mournfully slow, beyond the physical capabilities of its living counterpart. Customizing the circuits by their capacitors contrasts with voltage control of synthesizer parameters: the physical choice and placement of components restricts each box to a certain range and mode of recitation. The Gyuto Monastery is a sect of Tibetan Buddhism. It is well known for two reasons: enduring religious purges of Chinese Communism by moving down from the mountains into northern India, and the unique sound signature of the monks’ undertone chant. Undertone chanting involves the glottal folds of the oesophagus, usually silent in most traditions. The monks activate these glottal folds at a subharmonic of their chanting voice, emitting a supernaturally low basso voice. It is called “throat singing” because the magic happens in their throat. A simple circuit to realize this is a bass pulser. A square wave with an extreme duty cycle becomes a bass pulser, also known as a rectangle wave. The pulse wave is richer than a square wave, so it can excite the overtone synthesizer — a resonant filter to synthesize the Gyuto overtone singing. Overtone singers, including the Gyuto Monks, shape their mouths to create a whistling harmonic — usually the fifth — dwelling in and deriving energy from the throaty undertone. The monks, as they chant, join these two elements — the basso throat and whistling mouth — with a third: the text that specifies symbolic meaning, movement of the tones and other throat modulations. In a simple transistor emulation, slow ramp generators modulate the bass pulser through various low notes, tracing curves and sub-curves. A look at Tibetan chant notations (Fig. 2) inspires the synthesist because they do not structure the chants between barlines (as with Western notation), focusing instead on the unmediated squiggle. A resonant undulation, perhaps undulated again in speed, may generate a more sophisticated interpretation of the notated curves. A simple transistor hack (Fig. 3), however, facilitates the quick workshop, to emulate the monks, their chanted text and otherworldly whistles in ensemble. I hear a train’s call echoing in the river valley. From how it sounds, I imagine the train horn to be a cluster of three to five “hornlets”. Their range stays mostly within a musical fifth, as the millwright metalworkers who created these horns realized this ratio by practical plumbing of different length pipes. Perhaps these plumbers sought the loudest possible outcome of a steam or gas pressure horn, or the most æsthetically tooled, vandal-proof fixture for a powerhouse vehicle. I relish the absence of conservatory training in the subtle tuning variations of the trains’ multiple hornlets — a concentrated burst of industrial frequencies. I can hear the alternative tuning of industry as tempered neutral thirds (that are not particularly “musical”, in the Western sense) and other finer gradations. 3[3. The “neutral third” distinguishes Arab and Islamic music from Western twelve-tone music. Sitting somewhere between the minor (sad) and major (happy) third, I would like to speculate that it evokes warm and memories to those who grew up in Islam, and perhaps some discomfort in those who believe in only “sad” and “happy” sounds or intervals. It reflects a deep subtlety of emotion to map a pitch in the unknown, irrational place between the strong poles of major and minor. Ancient Arab theorists searched for a representative integer ratio, and only came up with subtler variations. The numbers in the “Wosta of Zalzal” ratio — 27/22 — pop up in the most common resistor values of electronics design. Exploring the musical dynamics of resistor ratios, I have found many neutral thirds (as discussed in my master’s dissertation “Stores at the Mall,” Wesleyan University, 2015). I can also hear them in train sounds, because the industry has tacitly found efficiency in this temperament.] Taking the range of a fifth and the presence of neutral thirds, I have devised a simple clef to notate the hornlet relationships (Figs. 4–5). The perfect fifth, a ratio of three to two, lines the top; in the middle, its square root (the most tempered possible neutral third) relates to the tonic at the bottom. The clef is printed wide so that the notation can express tuning nuances between the lines. A train starts its journey and I hear the conductor signal to his friends at the docks, later at an intersection with the road; the toots follow company regulations or the conductor’s whim. The terrain — a slow unfolding of brief intersections and signalling events (pulses) — affects the driver to toot his horn, infrequently in a pulsing manner. To emulate these night sounds you need a terrain, a driver who toots and his horn — a set of three to five static pitches, perhaps overdriven sine waves, normally silent, to be tooted. I first emulated natural sounds in fifth grade. While the most popular and handsome boys competed for murderers or kings in our class production of Macbeth, I attained Foley-man status. Focusing on the witches’ scene, I worked long and hard to generate crickets and other night sounds on the classroom synthesizer keyboard, which was by Casio or Yamaha. I realized it could never generate a perfect imitation, so I went with the weirdest. As I timidly faded these sounds in over and around the cauldron, I judged the parental audience’s reaction from the side — not a flinch. How could they perceive these strange electronic sounds without wondering about their emanation? The answer is that one expects the supernatural in an imaginary witches’ heath. Years later, while studying at the Oberlin College and Conservatory, I worked in the basement studios to piece together an idea about synthetic bird songs, programmed in Csound. 4[4. Csound is a computer music language by Barry Vercoe, initially modeled by Max Matthews. I have a fondness for the “orc/sco dichotomy”, wherein two files feed the programme: an orchestra and a score. With this strict separation, one can play the instrument builder one day and compose the next. A score is simply a list of “notes” but a birdsong takes different types of notes than a piano song — more about melisma and swoops than tonality or pianoforte.] At the time, I was working with Gary Lee Nelson, a pioneer of that programme, and Tom Lopez, who shared a love of the Ohio landscape and nature. I wanted to bring the synthetic bird songs to a wild setting there, as an experiment. I chose three general categories for the “birds” — a bat for a little cave near the Elyria waterfalls, a seabird for the rock caves in the wetland pier by the lake and a rock dove for the alleyway behind La Sotano restaurant. After college, building “performance” synthesizers kept me away from most frivolous thoughts of synthesizing birds, but birds did call in synthesis language. In Baltimore, my workshop on Bentalou Street adjoined an alley with parallel, brick walls and a juniper tree that hosted a perennial mockingbird resident. I felt privileged to develop a springtime relationship with the bird. In addition to imitating car alarms, it sang the circular and wobbly modulations emanating from the electronic organs I put under test. On moving from Baltimore to Portland, I experienced shifts in natural climate, personal attitudes, and also a profound and illuminating difference in the shape of the mourning dove’s nesting coo song. 5[5. The mourning dove, Zenaida macroura, related to the rock dove or common pigeon, is a territorial bird of the mild temperate climates. It generates three unique types of sounds: the whistling rush of its wings on a startled flight, a shrieking emergency call, and the calm song of its nesting coo that is the subject of this study.] Throughout my east-coast childhood I could hear a calm, summer afternoon heralded by the bird’s “oo wah-hooo-hoo-hoo.” The onomatopoeic notation (Fig. 7) consists of three essential motifs: “oo”, a held tone; “wah”, a swoop up high; and “hoo”, a mournful and pensive falling tone. Newcomers think it an owl by its night-like serenity, but grandmothers can correct that misapprehension. On the west coast, however, the song changes, and boils down to a simple “oo hooo-hoo-hoo”; the western bird has forgotten about the swooping “wah” of the east. I can imagine that the bi-coastal song variations come from the same bird, but the climate has modulated its brain to suppress the eastern “wah”; that motif lies dormant and unactivated. Does climate modulate brains? A typical stereotype of the two American coasts is that eastern humans have more grit from harsher climate, whereas western ones can relax, dial it back due to the pleasant weather. A circuit emulation of the mourning dove call-brain (Fig. 8) should allow for all of its three motifs: the “oo”, “wah” and “hoo.” The circuit should also be able to suppress “wah” as a compositional motif. The male mourning dove’s nesting coo signals territorial boundaries to other males and a willingness to mate with females. Its period is about every minute if the bird is relaxed, but it can speed up in response to the proximity and frequency of neighbouring nesting coos. Because it involves waiting, I chose “pine” as the codename for the call-brain’s periodic trigger. In Sino-Japanese cultures, the pine tree is an ancient symbol for waiting. As a popular nesting spot for the mourning dove, it also means space waiting: the dispersion and spacing of pine trees as territorial markers. The “bird” nests in the heart of the circuit; its call-brain must formulate the “oo”, “wah” and “hoo” as well as their requisite timing in the call. Extra credit goes to an emulation that can change coasts by suppressing the “wah” preferably without internal logics, but according to external (climactic) circumstances. In the solar sounder circuit format, the variable current output of the solar panel provides that variation. The transistor circuits are primitive enough that their reliance on supply current will modulate their sonic characteristics. 6[6. What is a primitive circuit? In this context, the lack of a regulator makes it simpler and more vulnerable to limited supply currents. A regulator is often placed on a circuit’s main supply to force it to a certain voltage. Without one, the circuit becomes more primitive and wilder. Another point to look for is the presence of transistors versus their more stable counterpart, the op-amp. Transistors, if uncompensated by tricky uses of complimentary pairs, react to changes in temperature and exhibit a wide variation in multi-dimensional characteristics that make each emplacement prone to idiosyncrasy. A final point about the solar sounders as primitive circuit is that their speaker amplifiers share the same solar panel as the synthesizer circuitry. Speaker amplifiers use decades more current then the actual generating circuitry, and as such they spike and “hog” the power line with all sorts of feedback. When this feedback enters the synthesizer by its power line, it can yield parasitic oscillations — extra and unplanned sound squirt — as well as dampening functionalities by sapping the power from a shaded solar panel. An elegant trick to prevent these symptoms is to separate the power supplies with two solar panels, and that helps define the single panel option as “primitive”.] In the mourning dove circuit, the “wah” arises from changes in the power supply. Full sun suppresses it, but shadows articulate it. An entry point for the analogue synthesist is the three shapes’ relationship to the three most common waveforms: square, sine 8[8. The sine wave trigonometrically inscribes a circle in Euclidean space, with its cosine friend.] and triangle. In monk, train and dove, each of the three shapes shall appear in different sizes according to their time scales: big for slow and smaller for higher frequencies (Fig. 9). In the monk circuit emulation, a triangle wave ramps the monk’s throat. The text spells the chant and a small circle represents the whistling mouth tone; the triangle wave modulates the square wave that feeds the resonant filter. For the train, the terrain is a big triangle, like a mountain — a sloping gradient of danger and triggering events. The conductor and his square-wave toot-toots! Finally, the hornlets are the sine-wave resonances in a group of five. The dove circuit swaps the roles of triangle and square, so the slow pine tree takes fixed form; it waits and briefly toggles “on” long enough for the bird to make its mournful call. The modulated triangle wave shapes the call as well as an independent triangle, to help with the subtle voice-crack and moan of this bird’s call, again realized on the circle of a sine wave. Having executed a triptych of circuit compositions, exalting in escapes from binarism, one asks: How to escape the trinary? By making another circuit or two, of course! Miles Davis trumpet style is microsound 9[9. Microsound, a treatise by Curtis Roads, defines an approach to sound inspired by the ability of digital editing workstations (DAW) to zoom into sounds and reveal moments smaller than the usual, or acoustic, musical consideration. From this standpoint, consider the trumpet playing of Miles Davis: other sounds of “ghost” duration hide between every “official” musical note. These sounds may not have musical qualities such as fixed pitch; they may swoop in tone or disclose much noise. ], and as such deserves electronic emulation for the interesting paths and alleys it opens to the composer. All the little squeaks and noisy flutters, which he never hid, like a birdcall, disclose nested tiers of modulation. Like the mourning dove’s “wah”, they have subtly suppressed calligraphy of song. For a fifth emulation topic, I look to the beach and try to undulate on the soul of the “sneaker” wave, the noticeably stronger wave that crests about every ten waves. The decade, or power of ten, is strong in electronic design because decimal notation overwhelms all others. So formulating the tenth wave could be as simple as choosing capacitors for cascaded decades of oscillators. Cézanne used the word “tourbillon” to describe his spinning brush strokes and their perception in the eye. He found the idea in the old physical texts of Lucretius, who conceived of the atom as vortex — a whirlpool. Leveraging this term, Cézanne’s paintings generate solid objects, such as an apple, in the mind’s eye, out of the little whirling tourbillons. Video 1 (0:46). Ensemble of 12 solar sounders built by the participants of a workshop led by Peter B at Rhizome DC in Washington DC in October 2016. I built the original circuits as paper circuit prototypes and moved later to fabricating them on fiberglass. To give the circuits a vintage feel, I learned to emulate hand-drawn traces in the digital format used at the printed circuit board (PCB) house (Fig. 10). First, I laid out the circuit in PCB software and printed it out at four-times scale. Using a sharpie, I traced around the sharp lines to make organo-form shapes, scanned and converted them into vector graphics. The result, reimported into PCB software, would be difficult to edit, but seems fitting for the analogue circuit ideas. 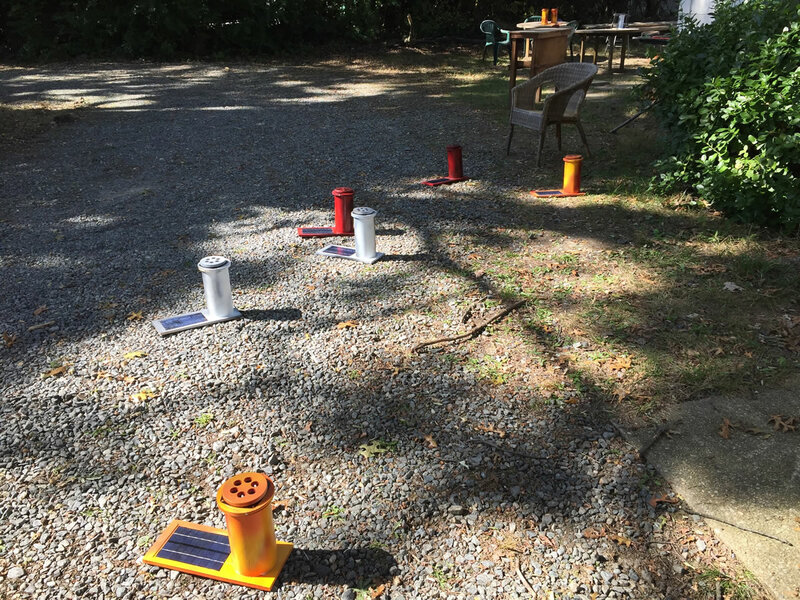 The first Solar Sounder Workshop occurred at Rhizome DC, a participatory culture space in Washington, with four pieces each of monk, train and bird boxes (Video 1, Fig. 11). We soldered and assembled the twelve-piece ensemble, then placed them in full sunlight. As permanent residents of the Rhizome instrument library, the boxes will eventually chance upon strongly sunny days — and, with the help of a good curator, sing out then! Print out the port-dock 11[11. Available as a PDF on the author’s website.] at full size. It will only fit on legal or extra long paper. Fold the printout down the middle and cut a piece of card stock to fit in between the halves. Using a squeegee, spread white glue, affix the paper and clamp the “sandwich” under books. The chip is an njm2073. For capacitors, use plastic film or ceramic, except for the large electrolytic marked by a circle and polarity marks. Excepting the electrolytic, all capacitors are in jellybean symbols. Try MLCCs 13[13. Multi-Layer Ceramic Capacitors.] for the biggest, poly film for the general audio range, and styrene for the smallest. The following table suggests a value for each, and explains in parentheses what customizations avail the sound. For example, making a “bird brain” capacitor bigger will yield a slower call. On inserting a component, shape its leads to follow the lines and solder it. Power comes from a 9-volt solar panel into the obelisk shape. Its square pad is ground. The speaker connection is to the crown shape near the njm2073 amplifier chip. Peter Blasser, designer and builder of synthesizers, practices deep consultation with clients who seek rich interactions with their electronics. The instruments manifest electronic modulations through pins, case flexure and radio fields. He teaches circuit design and instrument building in classes and workshops, culminating in performance or installation. Some paper circuits can be downloaded from his website, printed out and assembled to yield sound objects. The cybernetic interface uses the subtleties of touch, through discrete components, often “woven” together geometrically, to simulate intuitive patterns and chaotic sophistication. 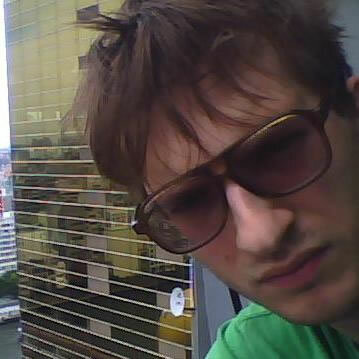 Philosophical concepts spur his designs, which acquire a narrative as they refine into essential analogue synthesizers. Peter completed his undergraduate studies in 2002 at Oberlin College with Tom Lopez, Gary Lee Nelson and Pauline Oliveros. In 2015, he completed a Masters in Composition at Wesleyan University, where he studied with David Behrman, Anthony Braxton and Ron Kuivila.